Barcode Maker Software for Retail Business provides help for Inventory control and Retail business to design and create high resolution barcode images in minimal time and efforts. Barcodes generator software provides advanced solution to create variety of Inventory Tracking, Retail Inventory and Retail Business useful barcode images in simple manner. • Advanced barcode label software design Linear and 2D barcode images in simplest manner. • Design and generate bulk barcode labels for commercial usage using various list creation options. • Flexible print settings to easily print designed barcode images using advance barcode printer process. • Design variety of different barcode label using advance barcode labeling process. 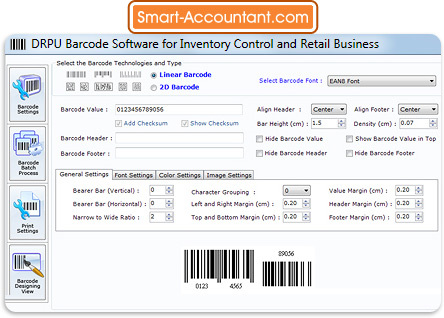 • Option to generate multiple copies of same barcode labels for future use.